As the nation prepares to celebrate Veterans Day, the flags over the White House and other federal buildings are flying at half staff in tribute to the dozens who were killed or injured at Ft. Hood, TX. It is unclear whether Major Nidal Malik Hasan, the alleged shooter, was politically motivated or acted because of emotional strain as he awaited deployment to Afghanistan. But the tragedy should remind the nation of the sacrifices our service personnel and their families make, especially during wartime. The stress among military personnel is palpable because for many of them, they are returning to Iraq or Afghanistan for the second, third, or even fourth tour of duty. And that torment is compounded for an increasing number of military service members when they learn that the federal government has issued deportation orders for a spouse or partner because he or she is an undocumented resident of the United States. These orders arrive while the service member is in the combat zone, or appear after the soldier has returned home, and occur whether the soldier is alive, killed in action, or missing in action. In 2007, the federal government issued removal orders for the undocumented immigrant wife of Army Spc. Alex Jimenes while he was missing in action. The proceedings were halted at the request of then-Department of Homeland Security Secretary Michael Chertoff, who was spurred into action by Senator John Kerry (D-MA). More recently, 26-year-old U.S. Army Spc. Jack Barrios returned from Iraq in 2007 suffering from post-traumatic stress disorder. He was immediately confronted with deportation orders for his 23-year-old wife Frances, a Guatemalan immigrant, who was six years old when her mother illegally brought her to the United States. Jack and Frances Barrios have a one-year-old daughter and a three-year-old son, and Frances is helping Jack deal with the hardships related to his mental disorder. Had it not been for DHS’s decision last week to grant a humanitarian parole, Frances’s only option would have been to return to a country she does not know—she grew up in Van Nuys, CA—and wait 10 years before being qualified to return as punishment for being brought here illegally as a child. Sen. Robert Menendez (D-NJ) has reintroduced the Military Families Act to deal with situations like this. The bill would grant lawful permanent resident status to any parent, spouse, child, son, or daughter of an active military service member or of a service member who died as a result of service. So far, Assistant Majority Leader Richard Durbin of Illinois and Democratic Sens. Mary Landrieu of Louisiana, Daniel Inouye of Hawaii, Kirstin Gillibrand of New York, and Russ Feingold of Wisconsin have signed onto the bill. Some conservatives, such as Representative Lamar Smith (R-TX) question the need for this legislation. Soldiers fight to preserve our rule of law, they argue, and when laws are broken, consequences must be paid. But proponents of the legislation have argued correctly that soldiers need to be military ready and focused, not wondering if the government they serve is going to separate them from their families. The Army’s 45 active Brigade Combat Teams have spent an average of just under 29 months in combat areas since 2002. Of these, all but the First Brigade of the Second Infantry Division, which is permanently based in South Korea, have served at least one tour. Of these brigades, 17 have served more than one tour or have had two tours in Iraq or Afghanistan; 16 brigades have had three tours; and five brigades have had four tours. These multiple and lengthy deployments without sufficient time at home have had broad consequences for the lives of the troops and their families. Our military is increasingly dependent upon immigrants to fill its ranks. Foreign-born members of our armed forces totaled 114,601 as of June 2009, or almost 8 percent of the 1.4 million military personnel on active duty, according to a new report by the Immigration Policy Center. 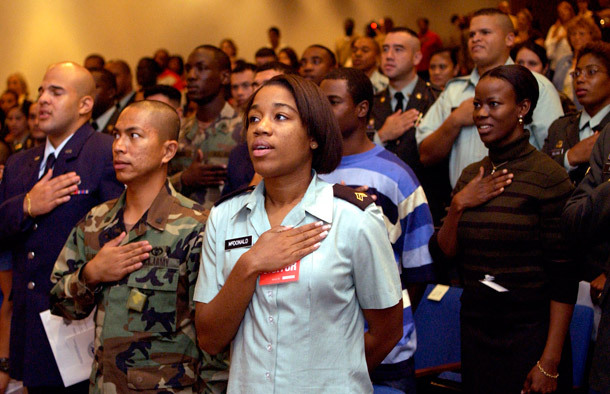 When the nation went to war after the September 11 attacks, federal policy was adjusted so that immigrants in the armed forces could become eligible for naturalization, regardless of their time in the United States or status. But the issue of military family members who are in the United States without documentation remains unresolved. At a time when our forces are thinly stretched, it does not make sense for military personnel to face the additional pressure of deciding whether to stay in the armed forces and abandon their families, or leave the service they freely joined and move to another country to be with their loved ones. Angela Maria Kelley is Vice President for Immigration Policy and Advocacy and Lawrence J. Korb is a Senior Fellow at American Progress.